The bay at the chancel end of the north aisle is dominated by the superb 18th century organ case. By its side there is a door leading to the choir vestry, which is panelled in oak with cupboards to match. On the wall above the door in the choir vestry is a preserved reredos – a painting or decorative panel normally behind the altar. This particular 19th century reredos was formerly behind the high altar. The memorial window in the organ bay is the work of Burlisson and Crylls in 1882. It shows St. Matthew flanked by angels and, above them, representations of the four corporal works of mercy (St. Matthew’s Gospel, chapter 21, verses 35-36). A second memorial window in the aisle shows Joshua, St. Patrick and King David; this window was made by Lavers and Westlake in 1900. Just to the west of the organ case is the Votive Candle Stand. This was acquired from Gloucester Cathedral in the 1980s and is used by individuals to commemorate the departed and to remember loved ones, living or departed, in prayer. 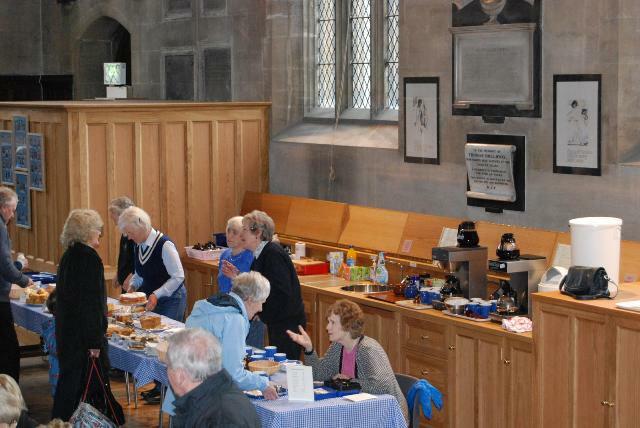 A toilet and kitchen area was added to the north aisle in 2012. Prior to the installation of kitchen and toilet. 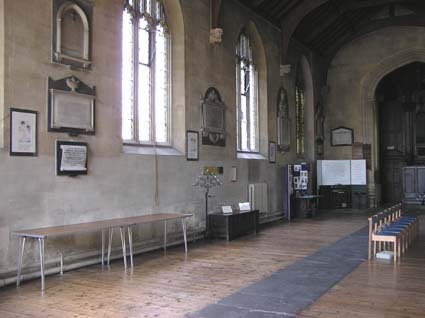 The North Aisle as it looks now. Also in the north aisle is a very remarkable 13th century vestment chest. Vestments are the robes worn by clergy during a service. This still has the original pin hinges and is absolutely unique. It is the only one in Britain which is carved both with geometric patterns and – on the front panel – with scenes from the Mediaeval Bestiary. The subjects were all of immense symbolic and religious significance to 13th century worshippers. You can see the Lamb of God between two doves bearing olive branches; a pair of unicorns; a fox preaching to fowls; a pair of leopards; a hound chasing a stag; and an owl mobbed by small birds. At the time, few people could read and it was therefore common to use pictures to tell people things. On the wall of the north aisle are the first four Stations of the Cross. Stations of the Cross are sequential points of focus in the church for penitential worship during the period of Lent prior to Good Friday. They represent steps in the Passion narrative leading to Christ’s crucifixion. In Roman Catholic places of worship there are often as many as fourteen Stations. From east to west, these are: (1) Jesus condemned to death; (2) Jesus takes up his cross; (3) Simon of Cyrene helps to carry Jesus’ cross; (4) Jesus consoles the women of Jerusalem. The other two permanently visible stations are on the wall of the south aisle.